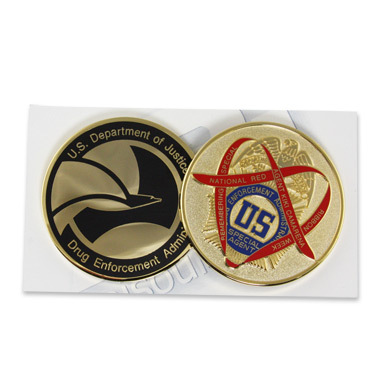 A coin that celebrates the Red Ribbon Week and the sacrifice of Special Agent Kiki Camarena, this coin features the DEA badge with a heart shaped red ribbon on one side and the DEA seal on the other. Size 1.75" diameter. Packaged in vinyl collector's pouch.